The Advanced Spaceborne Thermal Emission and Reflection Radiometer (ASTER) obtains images of the Earth in 14 different wavelengths of the electromagnetic spectrum, ranging from visible to thermal infrared light. 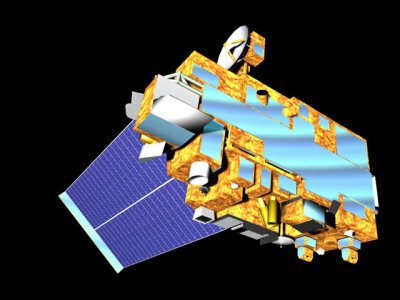 ASTER is the only high spatial resolution (15-90 m) instrument on the Terra satellite. The ASTER instrument consists of three separate instrument subsystems: the Visible and Near Infrared (VNIR), the Shortwave Infrared (SWIR), and the Thermal Infrared (TIR). Scientists use ASTER data to create detailed maps of land surface temperature, emissivity, reflectance, and elevation. Given its high resolution and its ability to change viewing angles, ASTER can produce stereoscopic images and detailed terrain height models. Go to asterweb to see more ASTER images. The Terra satellite was launched by NASA on December 18, 1999. The satellite carries five sensors (ASTER, MODIS, MOPITT, MISR and CERES) that study the interactions among the Earth's atmosphere, lands, oceans, and radiant energy (heat and light). The Terra spacecraft is roughly the size of a small school bus. Find out more about Terra on http://terra.nasa.gov. Artist's rendering of the Terra spacecraft. Source: NASA/GSFC/Reto Stockli.